MANILA - In the Philippines, most families don’t earn enough money to support the education of their children. Because of this, many students work while studying in order to earn money that will support their studies as well as their family. Indeed, we’ve heard countless success stories of working students who made a lot of sacrifices just to achieve their dream. Facebook user Facia Lois Estive has decided to share the inspiring story of a young working student who sells corns to support his studies as well as his family. 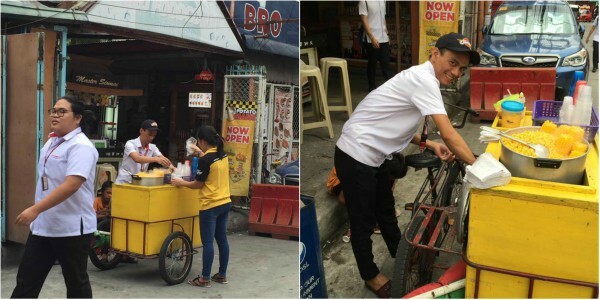 The student caught her and her friends’ attention because he was wearing uniform while selling corn. “Kumakain kami ng fries ng kaibigan ko sa Gastam. Tapos napansin niya si kuyang nasa tawid lang. Sabi niya "Tingnan mo si Kuya oh, naka-uniform". Akala ko kung anu-ano nanaman sinasabi. (Malakas kasi trip nito) Pero tumingin naman ako. Si Kuyang shs nagtitinda ng mais. Nung time na yon, maraming bumibili sa kanya. So pinicturan ko siya after umalis nung mga sinerve-an nya. Tapos lumapit ako,” Estive narrated. The working student identified as Joel Mendiola is a Grade 12 student taking the Humanities and Social Sciences (HUMSS) track. According to Estive, Mendiola is planning to major in Psychology and intends to work as a social worker in the future. But in order to achieve that dream, Mendiola has to peddle corn. He revealed that he would give all his earnings to his mother and would just ask for allowance from her. Hoping to inspire others, Estive decided to share the story and photos of the working student on social media. She also urged the public to support Mendiola by buying corn from him. “Nakaka-inspire. Nakakatuwa na kumakayod siya para na'rin sa sarili niya. Nahiya ako bigla, feeling ko puro ako hingi kay Mama ko. Hanggang house chores lang ako," Mendiola added. Check out the inspiring story below.